These pictures are the first from the morning before work — without make-up and looking a little out of it, since it’s not even 8 a.m. — and the first one inside my apartment. 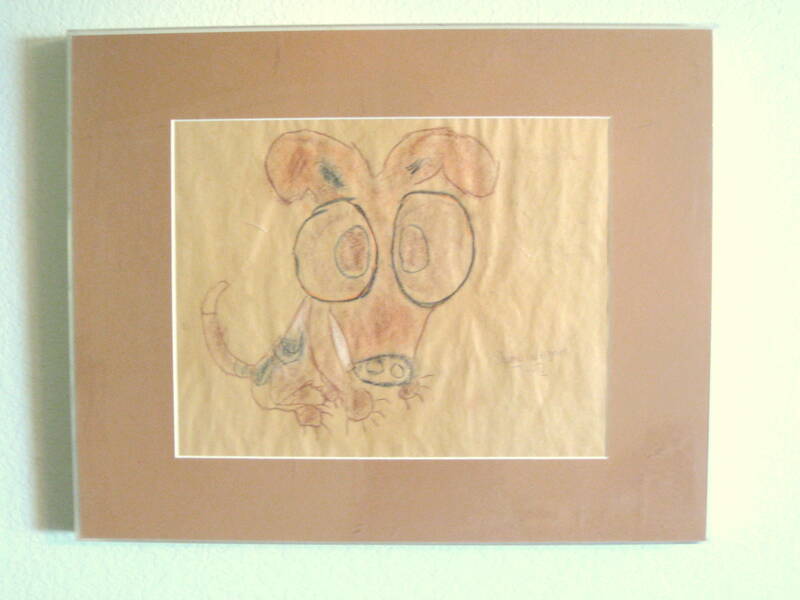 The artwork on the wall is a drawing my oldest brother made of his dog when he was 13. He left it behind when he joined the Navy, and I really like having it in my home. The large portrait of Kalayna is also in the living room; the two pieces work well together. July 4, 2010. Tags: clothes, Goodwill, portrait, What I Wore to Work Today. Pictures, What I Wore to Work Today, Words. Leave a comment. Sometimes, when you have a dog, your mother commissions a portrait of the dog for your birthday. 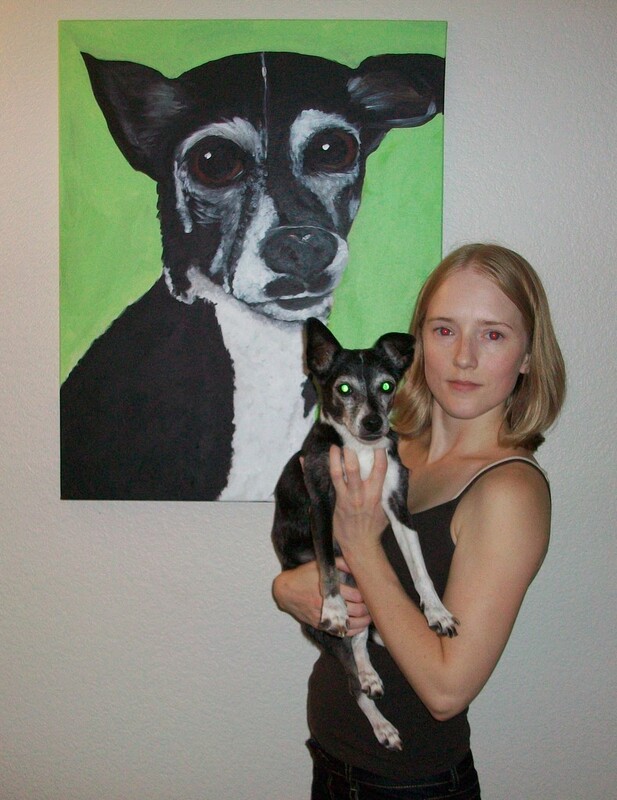 She asks your brother to take a picture to use as reference, and he makes the dog sit while taking the photo and the dog looks unhappy in the reference picture. Sometimes, when you have a dog, and you receive a large painting in the mail, you don’t know what to do with it when you move into the new house. The previous owners of the house left nails in the wall, so you use one of the nails to “temporarily” hang the painting in the hallway that leads from the kitchen to the rest of house. A year later, your mom visits and finally takes a picture of the dog with her portrait, which still hangs from the same temporary nail. Sometimes, when you have a dog, you decide that early October is the time you will take her to the vet to let her go, a few weeks after her 16th birthday. 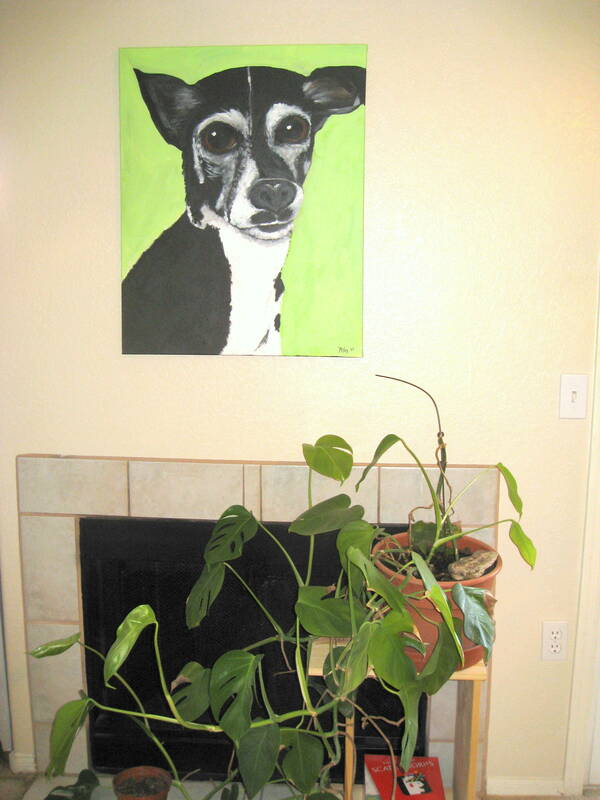 You wonder if the eye-catching portrait, painted a few years earlier, will be more or less weird when the dog is gone. August 23, 2009. Tags: Dog, painting, portrait. Dog, Pictures, Words. 4 comments.